One aspect of toy inventing that can, sometimes, be exciting is never knowing when a bright idea might jump up, and bite you on the nose! That is exactly happened when I discovered "Funny Bones." The product can be seen, virtually complete, and ready to go, in the final seconds of this Betty Boop Cartoon. Of course I’d seen this cartoon many times before. It is one of Betty’s best, and certainly the most surreal. And, it features Cab Calloway as well. One day, when I happened to be watching it again, the thought suddenly occurred to me, upon viewing the final scene: My God! I could make that thing! And so, I did! 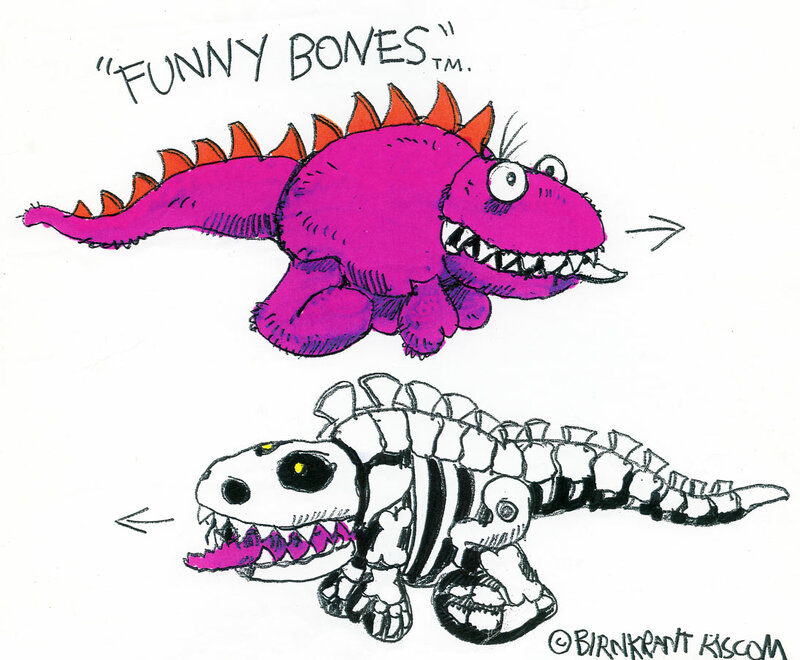 When I came across two drawings of Funny Bones, several days ago, I set them aside, trying to decide if they were worth including here. I finally made up my mind that they were not! There was just not enough there. The drawings are not exceptional, and beyond them, there was nothing to prove that the concept was even possible, and not merely the ins and outs of reality in a Betty Boop cartoon. On the other hand, I knew this product was not just wishful thinking, for I had once made a working prototype that turned out to be spectacular, exactly like the dragon in the movie. Having never seen that prototype again, since the day I handed it to KISCOM, I assumed that it was lost. And, no doubt, it is. 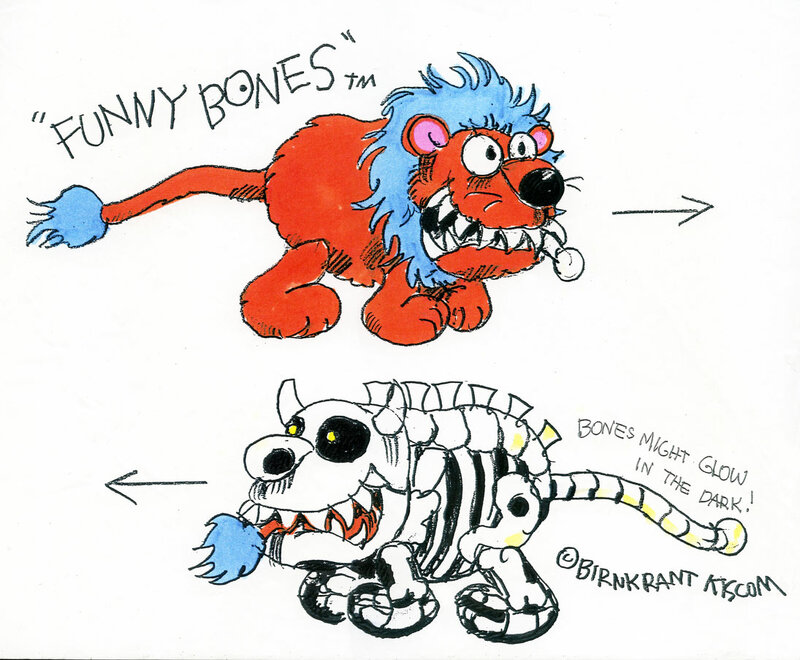 Therefore, there was a huge surprise in store for me today, when, looking for other things, I suddenly discovered two actual working samples of “Funny Bones.” I did not realize these existed, or that any toy company had attempted to explore or manufacture them. My God! Somebody took this idea seriously! These working samples were made professionally, maybe even manufactured. I could see that the bone design was finished art, printed and applied to the lightweight nylon fabric by some sort of heat sealing process. These samples were not merely handmade. Patterns had been created. Fabric had been printed. And the eyes were cast in plastic. Therefore, I decided that there was enough here, after all, to merit adding Funny Bones to this website. So, first of all, here are the boards! I recall that at one time, there were more. These included other animals and a dragon that resembled the one in the cartoon. Originally, I envisioned an entire line of dinosaurs, and several monsters too. And here are the two creatures that I found today. They were wrinkled up and stuffed into a box of stuff that my partners sent up to me, many years ago. This might have been the first time I looked inside. At first glance, I didn’t realize what they were. What an nice surprise! 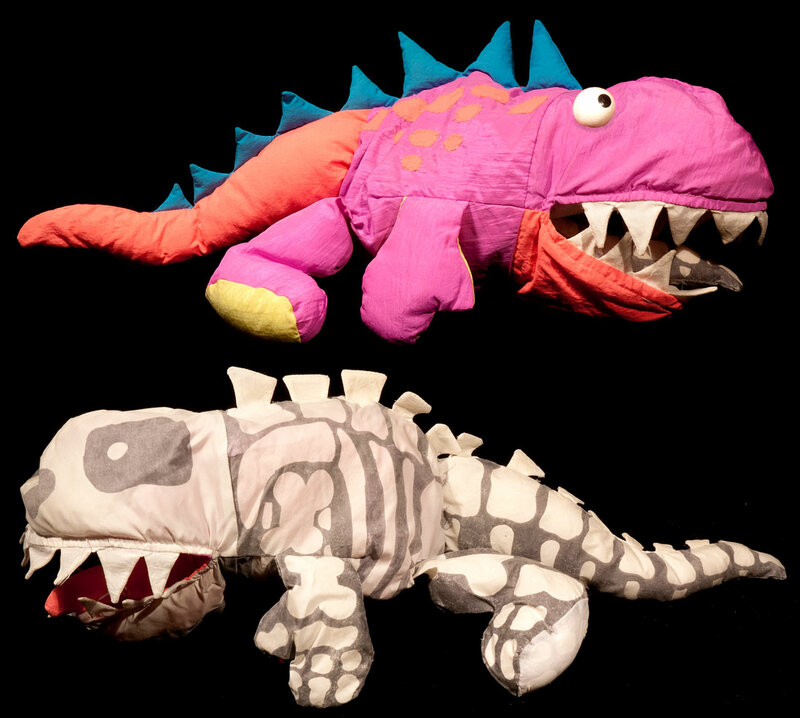 The creature I originally sewed was actually much nicer than what you see below. 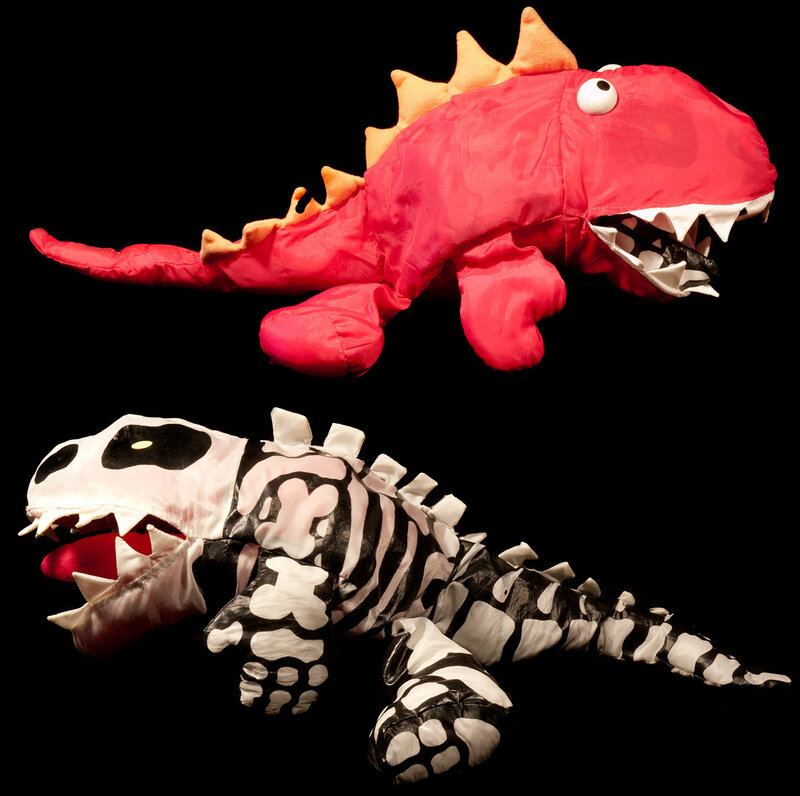 I made it out of plush, with the inside lined with cotton, upon which I drew the bones. The samples that I found today are made of some sort of nylon. This has the benefit of being slippery, but is not as substantial as my original. It really is a tradeoff. But, as they do work well, and easily turn inside out, I’d be hard pressed to decide which material was best. One might wonder how I could have failed to notice these when they were returned to me, I'd estimate, some twenty years ago. I’ll endeavor to explain: My task was always just to sit here in my ivory tower, pumping out ideas, while my partners KISCOM ran around to every toy company in the nation, and others overseas, trying to sell the products that I and, eventually, a few other inventors made. They were constantly cutting deals, hopefully large ones, usually small. There is a saying in the toy inventing community: "A successful product, is one that ninety-nine out of hundred companies turned down." The saying is actually quite true. Thus, if I were to keep up with what my partners were up to, I would have had to endure the pain of several rejections every day. Therefore, I ignored much of what was going on, and concentrated on the latest idea in my head, the latest product on my desk. And let my partners do the rest.